I like your seed germinating system. I think its very good. However I am abit worried about the peat you use. I have used this in the past and its good for germinating seeds but seedlings start to die of when they grow. One of the great benefits of growing cacti and succulents from seed is the large availability of different species and the relatively low costs of seeds compared to plants. Personally I get the most pleasure from raising my own cacti and succulents. Germinating cacti and succulents from seed gives you the opportunity to see your plant grow from seedling to full grown flowering plant. I offer a nice selection of cactus seeds, succulent seeds and seeds of other exotics. 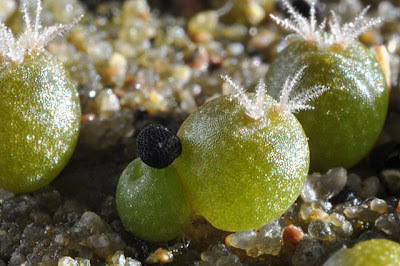 There are many ways of germinating cactus and succulent seeds that have been proven successful. Here I will describe a method that I have found successful for most species. The process of germinating cactus and succulent seeds will be explained using a step by step protocol. First I will present a list of essential equipment and other things needed for sowing seeds. Prepare the germination soil mix by mixing riversand with regular potting soil and 1-3 mm grit (1:1:1). Make sure that your sowing medium is very loose and airy. I usually take a fist full of the mix I just made and make a fist with it. When you open your hand the mix must loosely fall apart. If it sticks together like a ball then the medium is to tight and you should add some grit to loosen it up. If you want you can sterilize the sowing medium for 2 hours in a high pressure cooking pot or use a microwave and sterilize for 15 minutes at 180-200 °C. You also have to sterilize some 1-3 mm grit to put on top of the sowing medium. Grit can be sterilized in the same manner as the sowing medium or it can be boiled for 10-15 minutes in a cooking pot filled with water. After sterilization keep the cooking pots closed and let the medium and grit cool down overnight. Clean the containers with hot water. Prepare and clean a table for the sowing and keep ready all the equipment you will be needing. Use 1 container per species of cactus. Fill the plastic containers for 50% with sowing medium and slightly press it down. Now fill the container with sowing medium up to approximately 1 cm under the edge of the container. Add 0,5 mm of (sterilized) grit on top of the sowing medium. When all sowing containers are filled as described, put them in the watertight tray filled with water. Seal the tray in a plastic bag or with a large lid to prevent infected air coming in and let the containers soak up the water for about two hours. Take the containers out of the water and let the excess water drip out. Now fill the tops of the containers for approximately 0.5 cm with grit (1-3 mm). Divide the seeds equally on the top layer of grit. Naturally, one species of seeds per container. Slightly press the seeds in the grit but also make sure to do this in a sterile way, for example by putting your hand in one of the clean sandwich bags. Put a plant marker in each container and write the name of the species and the date on it. Now put each container in one of the transparent sandwich bags. NB. with the opening of the bag facing upward. In this way water leaking out of the containers will stay in the bag and no insects can crawl in through the drainage holes. Now close the bags and place them at approximately 23°C under medium light conditions. Do not use to bright illumination and certainly do not use direct sunlight because this will burn the seedlings. You will know when your seedlings are burned when they start to turn reddish brown. When this happens immediately reduce the light intensity. Most seeds should germinate after about 14 days but this varies with the species of cactus or succulent. After germination carefully open the bags to check for possible infections and to see if most seeds have germinated. If all seeds (or most) are germinated you should make 2-4 small holes (for example with a big needle) to let the seedlings slowly adjust to dryer air. It is very important now to check the containers at least once a week. Each week 2-4 new holes must be made into the bags and after approximately 2 months you can remove the bags completely. Keep checking the seedlings on a regular basis for infections with insects or fungi. When the bags are removed the soil will dry fast so make sure to let the containers absorb some warmish water. Do not let the containers dry but also do not keep them soaking wet after the seeds have germinated. Transplanting seedlings into fresh soil is needed when (1) the soil is completely dried out or (2) the seedlings have no more room to grow because they are packed together to much or (3) when a major infection with fungus or algae has occurred. The seedlings do not have to be transplanted in sterilized soil. Just use the same soil mix I described earlier and they should be ok.
As the seedlings grow try to increase the light intensity but be careful for burning because young cacti and succulents are very sensitive." Allard, I understand your worries about peat and agree that you shouldn't overdo it. Still, I (and my seedlings ;-) like its water retaining properties combined with the good drainage ensured by the sand and limestone gravel. In general there is probably as many soil types used as there are people growing cacti - people should experiment until they find a soil type that works for them. I repotted my 13-year old Lophophoras yesterday, and noticed something important. For years, I had wondered why two of my cacti had remained very small, while all others had grown substantially in size. The pots had had been similar. As I took the cacti put of the old pots, I saw that the normal ones had healthy, sturdy and taproots, while the smaller ones had a stuntet, minuscule taproot and an enstensive, brush-like root system. The culprit was that in their pots, the bottom layer of the growing media was just ordinary potting soil with no grit added. As a result, it had become rock-hard and impossible for the taproot to penetrate, resulting in stunted growth and the development of an odd root system. Based on this, I think that my current potting soil does not contain enough grit (1 part grit, 2-3 parts soil). I may also have damaged some of the roots in many plants. Too bad, I'll just have to watch how the plants thrive. Furthermore, as the plants grow, it's getting more and more difficult to locate suitable pots, which would be tall and narrow enough. Maybe I'll make the next pots myself. Adult young lophs (three years old) suports how many hours of direct sunlight? I never find information about this. PS. Sorry for my misplaced coments at the other topic. Dyro, thanks for sharing your experience. It clearly illustrates the need for a loose, open soil that doesn't compact with age. Regarding pots, Uhlig Kakteen (and probably others) sell tall plastic pots, e.g. 7x7x11 and 9x9x14 cm pots. 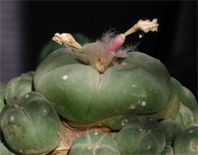 Lobo, the following reply is based on the additional information you supplied at the Lophophora and Epithelantha post. Given the natural habitat of Lophophora I would say your plants should be able to endure multiple hours of tropical sun per day if properly acclimatized. Slowly introduce the plants to increasingly more sun every day; if they assume a reddish hue they are receiving too much sun, i.e. they are getting sunburned, and should be protected in the shade. What species of Lophophora are you growing? Hi there, really nice blog, hope you have the time for answer an inquiry: My peyote has a strange condition in his button, seems like warts. Do you know a good documented blog,text etc. to find some answers. neter, I have no experience with nor knowledge of a condition like the one you describe. If you have photos of the plant you can join http://groups.google.com/group/lophophora and post the pictures along with your description (by sending an email to "lophophora [at ] googlegroups [dot] com") to see if anyone at the group recognizes the problem. Hi, have you sprayed GA(500ppm ga3) on adult plants, i know it's usefull for seeds but wondered if you knew how to make a cactus 'pup' from every orifice!!! BA helps, i'm still working out what ratio for the 2 but as things happen so slowly in cactusworld, and these hormones hang around for so long ,...i doubt my lifetime will yield an answer. Cactus Jay , DRYSCAPES , spain. Hi Cactus Jay, I'm afraid that I'm a novice when it comes to chemical plant growth regulators - the only "performance enhancing" measures I've taken to is grafting ;-) That being said, I would be very interested to learn more about your experiments and any references you might have to this subject. I simply LOVE your blog Loph! This is the most hip website I have visited since the Shroomery. Keep up the positive vibes my friend! Watering approximately every third week during the growing season should be fine - if the weather is sunny and hot I water more often than that, just make sure that your plants are not wet for extended periods of time (always let them dry out completely between watering). If your Lophophora is planted in fast draining soil you might want to soak it thoroughly by submerging the lower 3/4 of the pot in a pan of water for 15 minutes. I've been raising cacti from seed since 2008, but this year I bought more seeds than on the other years.Unfortunately this year I cant put all the seeds to germinate and I've got a good amount of seeds. what can I do for keep the germination rate good?store in the refrigerator? Yes, I store excess seeds in the refrigerator with good results. The pros at the Svalbard Global Seed Vault (nicknamed the Doomsday Vault ;-) store their seeds at minus 18 degrees Celsius, which I presume is optimal - but the fridge at plus 4-5 degrees Celsius works fine for me (I haven't dared freezing the seeds as I'm uncertain if it requires special preparation of the seeds). lucas503, sorry for the extremely belated reply. Peyote cacti are slow growing plants and the only way I know of for effectively speeding up the process is grafting. gday from down under can you please tell me how much sun my girl should be getting,seems to grow much better in the shade,flowers once or twice a year and looks very healthy.and any suggestions on a fert? Very informative information. Thank you for this well written article. I will be bookmarking your site. I got the seeds to germinate and after one month I moved them out of the humid environment and into the open air and began giving them limited sunlight. They have turned brownish and I fear they are dying. What should I do?